Afghan Hound Dogs - The Afghan Hound is a very old sighthound dog breed. Distinguished by its thick, fine, silky coat and its tail with a ring curl at the end, the breed acquired its unique features in the cold mountains of Afghanistan, where it was originally used to hunt wolves, foxes, and gazelles. The Afghan's delicate temperament and long, flowing hair has earned it the widely-used nickname of "person dog". Other alternate names for this breed are Balkh Hound, Baluchi Hound, Barutzy Hound, Kabul Hound, and Tazi. The Afghan Hound is tall, standing 24 to 29 inches (63-74 cm) in height and weighing 45 to 60 pounds (20-30 kg). The coat may be any colour, but white markings, particularly on the head, are discouraged; many individuals have a black facial mask. Some are almost white, but particolor hounds (white with islands of red or black) are not acceptable and may indicate impure breeding. The long, fine-textured coat requires considerable care and grooming. 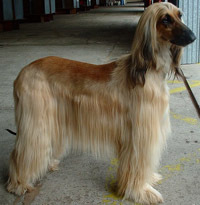 The long topknot and the shorter-haired saddle on the back in the mature dog are distinctive features of the Afghan Hound coat. The high hipbones and unique small ring on the end of the tail are also characteristics of the breed. This information is licensed under the GNU Free Documentation License. It uses material from the Afghan Hound article on Wikipedia.org. Afghan Hound Breeders - Advertise your kennel puppies and dogs here. Alisdan Kennel - Romania - Afghan Hound, Borzoi and Irish Wolfhound. Our hounds are family members. We show for fun and we breed for quality.